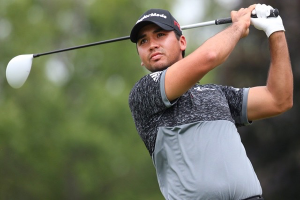 Photo By: Benjamin Rogers Jr.
Jason Day putted for birdie on every hole Thursday and made half of them for a 9-under 63 that tied the course record and gave him a two-shot lead at The Players Championship. Day played alongside Jordan Spieth, who was playing for the first time since losing a five-shot lead on the back nine at the Masters. Spieth had another poor finish at the TPC Sawgrass to post a 72 on a day that felt like hard work. He missed a 3-foot putt and took double bogey on his last hole. He was 3 over on his last five holes. Masters champion Danny Willett opened with a 70. Day only missed three greens all of them just off the putting surface. “I can’t really recall the way that I hit the ball as well as I did today, and then also putting as well as I did,” said Day, who has won six of his last 16 starts. Many others were elated about their games, too. Two shots back at 65 were Cameron Tringale, Brendan Steele, Shane Lowry, Bill Haas and Justin Rose, who hit all 18 greens in regulation. Six players were at 66, including Brooks Koepka, Boo Weekley and Ernie Els. Another 10 were at 67 and 10 more at 68. The field averaged 71 strokes.